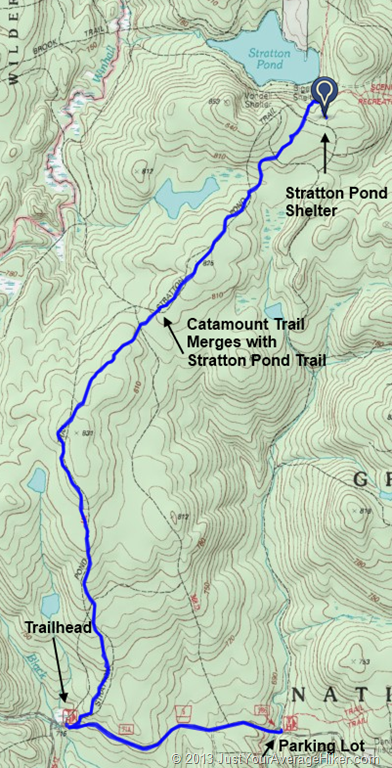 My muscles are just starting to recover from this weekend’s backpacking trip to the Stratton Pond Shelter via the Stratton Pond Trail in Stratton, VT. Not that it was a difficult trail, I am just woefully out of shape. 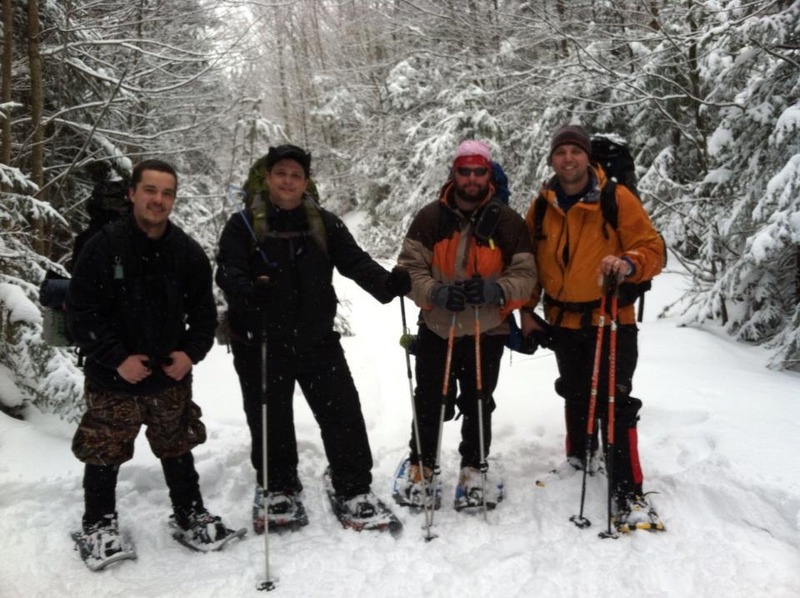 The weather was absolutely perfect for a winter snowshoe/backpacking trip. Temperatures during the day averaged in the low thirties, while overnight, temperatures dipped into the teens. 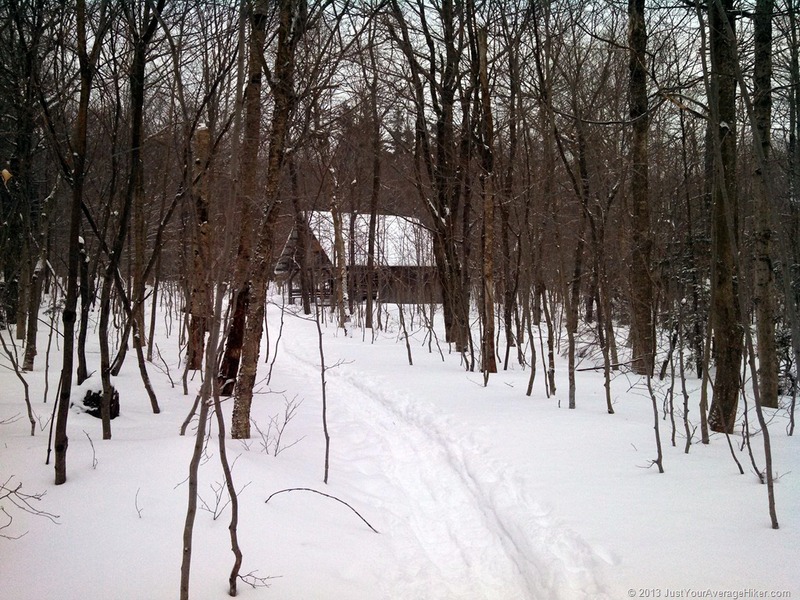 We had a steady snow for just about the entire trip, and the trail was freshly broken in by our group, except for a lone set of tracks where the Stratton Pond Trail and Catamount Trail merged. I estimate we only had to break-trail with our snowshoes about 6-8 inches down to packed snow for the most part for the trip. We had a few fresh inches on our way back out. Once we were a couple of miles away from the trailhead, the sounds of the what seemed to be hundreds of snowmobiles that were out on the main Class 2 snowmobile trail where the trailhead was (see picture below), everything was quiet for the rest of the trip until we came back within earshot of the snowmobile trails on our trek back on Sunday. And except for what sounded like automatic rifle fire in the far distance ~7:30PM, all was blissfully quiet and serene. I loved this trip – medium difficulty, because of snowshoeing and carrying 50lb packs. Otherwise, for a day-hike during the non-winter months, I would give this an easy rating. Below is all of the information I could furnish on the trail – I hope this is useful! It is one of the nicest I have seen. It can easily sleep 12 people on the upper and lower bunks in the main part of the shelter, with an additional 4-6 comfortably in the loft area overhanging the front of the shelter. Lots of hooks to hang gear. 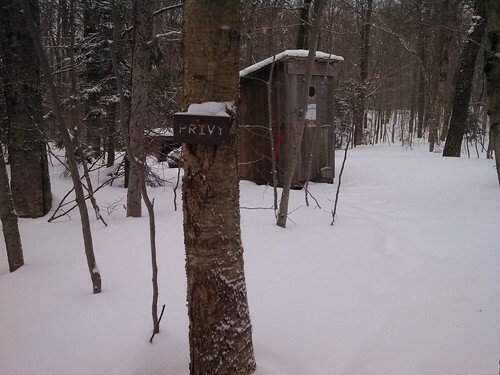 There is also a privy! If you need to do your business, about 100 yards away from the Shelter, there is a privy, stocked fully with mulch for covering up your business once you are done, both behind the outhouse itself, as well as extra in the shelter. The map in the above PDF is terrible. I would suggest printing out a trail map from here, courtesy of the USGS. 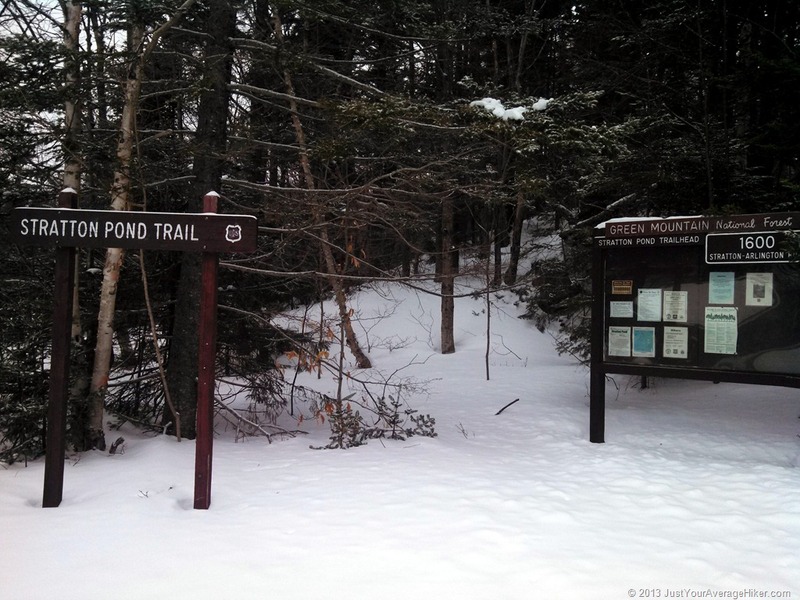 Search for Stratton Pond Trail, Stratton, VT. The map above with Points of Interest, is from MyTopo.com. This is not free. 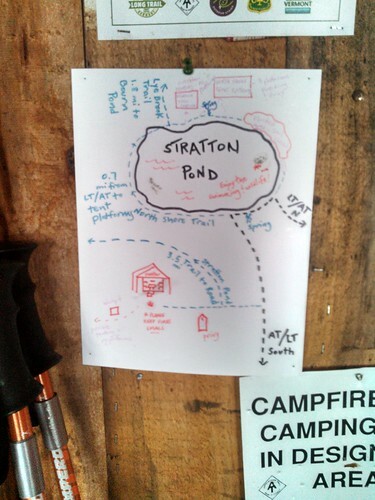 The address of the Trailhead is 1600 Stratton-Arlington Road, Stratton, VT. If you GPS it, it will take you down the wrong road! Use the coordinates above to get there. Above: Chuck, Cotton Turtle, me, and The Machine. Photo courtesy of Bull in a China Shop. Photo taken at the intersection of the Catamount Trail and the Stratton Pond Trail. Have any links to add regarding this trail? Leave them in the comments! 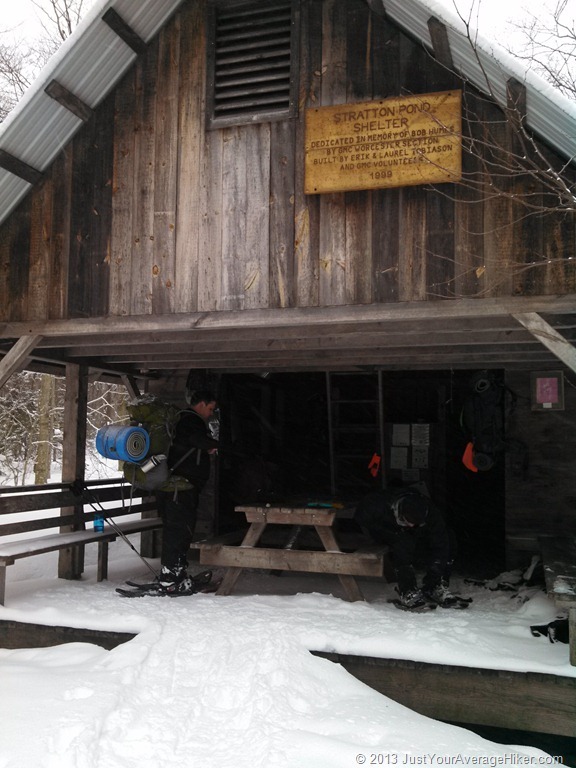 This entry was posted in Backpacking, Trail Resources and tagged Backpacking, camp, camping, Hike, Hiking, Snowshoe, snowshoeing, stratton, stratton mountain pond, stratton mountain pond trail, stratton pond, stratton pond trail, stratton vt, Trip, Winter. Bookmark the permalink. I just found onto your site. Nice job. If there is a better category or tag to follow let me know. Thank you! I’ve added a link back to your site as well under my Links section – love the site!